If you’re looking for the music from the trailer of Rio, it’s a brand new recording of Sergio Mendes’ classic bossa nova hit with Brasil ’66, “Mas Que Nada”, it’s listed on the official soundtrack of Rio. 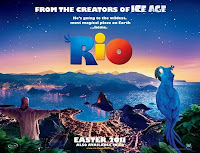 The movie soundtrack of Rio will be released on April 15, 2011. The song is called Whoomp there it is by Tag Team. my kids are mad bout this movie.. they have watched it like a million times but everytime its like the first time.. they know every words and sing each song man.. and they’re only two n one year old.. love it. my favorite song is “telling the world” its very cute and i love the whole movie.. Which is the song that Rafael sings to his wife? Can’t find it in original soundtrack list. I’ve been trying to find “Drop It Low” by Will I Am. Where could I find that? I like that tune. It’s not on iTunes. I can’t wait to go see Rio 2 and see what other good songs they are going to play in the movie. My favorite songs from Rio are “Telling the world” and “I wanna party”. What is the name of the love song he sings, that goes “wasn’t looking for a….